Includes course fees, accommodation in twin-share room and all food for 28 days. Does not include flights/taxi transportation. Includes course fees, accommodation in private room and all food for 28 days. Does not include flights/taxi transportation. Six days a week. Seventh day for day-trips. 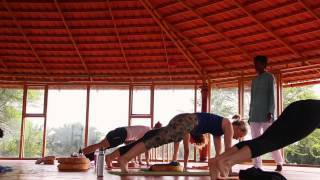 Practices: Asanas, pranayamas, kriyas, mudras, bandhas, meditation, and chanting. Learn: Classification and sequencing of all yoga asanas (poses) and adjustments techniques to correct your students or yourself. Healing: Therapeutic benefits of yoga and precautions and contraindication. Theory: Introduction to yogic lifestyle, Historical evolution of Yoga, Types of Yogas, Patanjali Yoga Sutras, Yoga Anatomy & Physiology, Translation of important mantras. Includes both human physical anatomy and physiology (bodily systems, organs, etc.) and anatomy of Pranic body: chakras, nadis, etc. Includes both the study of the subject and application of its principles to yoga practice (benefits, contraindications, healthy movement patterns, etc). Includes the study of yoga sutras, Essence of Bhagavad Gita, Historical evolution of yoga, the yoga lifestyle in a materialistic society, and ethics for yoga teachers. If time permits, basic Sanskrit and translation classes. Includes practice teaching, receiving feedback, observing others teaching and hearing/giving feedback. Also includes assisting teachers in daily practice class.